The complete results to include the list of topnotchers or top 10 passers for March 2017 Mechanical Engineer ME board exam are available on this page once released online on Wednesday, March 22. Brylle Pahimutang Gilbuena of University of Cebu in Lapu-lapu and Mandaue topped the board with 88.10%. 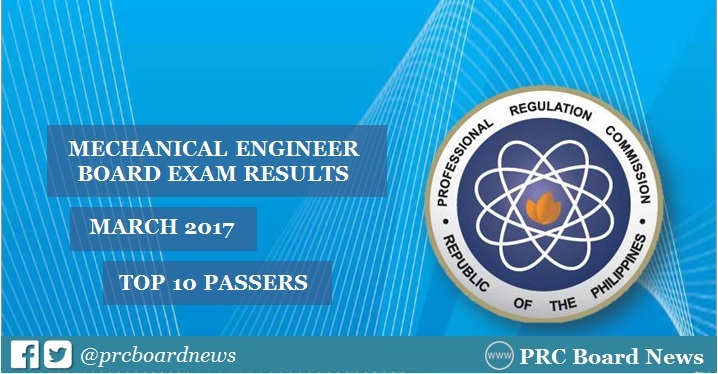 The Professional Regulation Commission (PRC) and the Board of Mechanical Engineering conducted the licensure exam on March 18 and 19 in the cities of Manila and Cebu. During the past board exams, PRC did not release list of topnotchers for Certified Plant Mechanic (CPM) except for September 2015 in which one school produced highest placer obtaining 82.05%. In the same period last year, University of Cebu (UC) graduates dominated the licensure exam garnering three highest spots including the first and second places. In March 2015, Batangas State University (BatSU) alumni ranked first and second, respectively with two more graduates obtaining spots in the top 10.